About William Kasper, M.D., F.A.C.S. William S. Kasper, M.D., F.A.C.S., is the Emeritus Acting Chairman of the Department of Ophthalmology of Winthrop-University Hospital, Mineola, N.Y., a position that he held for 15 years. He has been listed in the prestigious Castle and Connolly publication, "How to Find the Best Doctors: New York Metro Area," for the last 16 years, an honor bestowed by patients and colleagues. 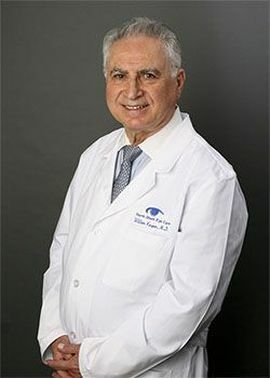 As past Presidents of the Long Island Ophthalmological Society, and the Ophthalmology Section of the Nassau Academy of Medicine, Dr. Kasper has contributed both to the scientific and educational information of its members. Nassau County Medical Center Ophthalmology Residency training has been a priority over the years, teaching the young physicians both the art and science of the specialty. Journal publications have included topics dealing with laser iridotomies, current concepts of cataract surgery and intraocular lenses, a toxic eye medication, corneal iron lines and edema, and rhinosporidiosis of the eyelid. Internet articles have dealt with eyelid lesions, toric lenses, diabetic nerve palsy, and insurance problems. Research projects in the past have been funded by Hoffman-LaRoche Pharmaceutical firm evaluating treatment for Diabetes Mellitus, and presently an ongoing clinical investigation exists for Amgen involving ocular evaluation associated with prostate cancer treatment.